In 2004, Stephen LaBelle started out as a one man operation, cleaning up storm damage due to the recent hurricanes. It was through helping people that the idea of Doc’s Restorations developed and motivated its growth into what it is today; an extensive list of repeat customers, referrals, new customers daily, 35 vehicles, a beautiful design center and a family of 56 highly skilled Craftsman, Managers and Office Support. We are truly grateful to all of those who choose and continue to choose Doc’s Restorations for their home improvement needs. It is a sincere pleasure serving each and every one of you and we look forward to providing you with more quality kitchen and bath remodels, floor installations, designer backsplashes, painting and handyman services with the utmost professionalism and attention to detail because Doc’s Restorations and its dedicated staff prides itself on ensuring 100% customer satisfaction. It is our mission to focus on your needs and expectations through excellent planning, procuring, execution and communication. 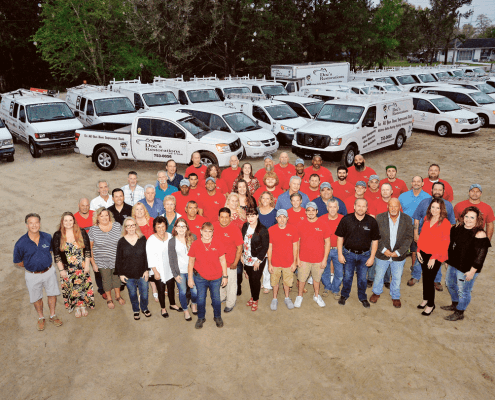 By providing you with outstanding customer service from One Company, One Source, One Solution, it is our hope that Doc’s Restorations is your choice for years to come. Steve and his employees have been doing work for Woodland Villages and Maples Town Homes for over 4 years. Steve and his employees are excellent craftsmen with impeccable attention to detail no matter what they are doing. They are always conscientious of a clean work site, finishing projects timely and within budget. Our homeowners and Board members are very pleased with their professionalism in our associations. Thank You and Great Job! You took a 1991 built home and made it look sparkling new. My mother is thrilled and can’t believe how good the home looks. You took a task that would have taken us time to do and got the job done in a few hours. The price was affordable within our budget and the service was excellent. I would definitely use your service again and recommend to all my friends and clients.Doc’s Restorations…CAN FIX IT! Thank You!